Anytime I demo my Vive Pro to friends or clients, the response is generally “how do I get setup with one of these at my own house?” Then I’ll explain all the hoops they have to jump through… investing in a powerful computer, drilling a tracking system into your wall, and the high cost of entry, people quickly lose interest. There are lots of affordable options for headsets that use a smartphone for the screen (such as Google’s Daydream or Samsung’s Gear VR), but they are a big departure from their PC dependent counterparts, and usually leave the user feeling fatigued or sick. Oculus now has a potential solution for those who want to try VR, but don’t want to deal with an expensive PC setup: The Oculus Go. 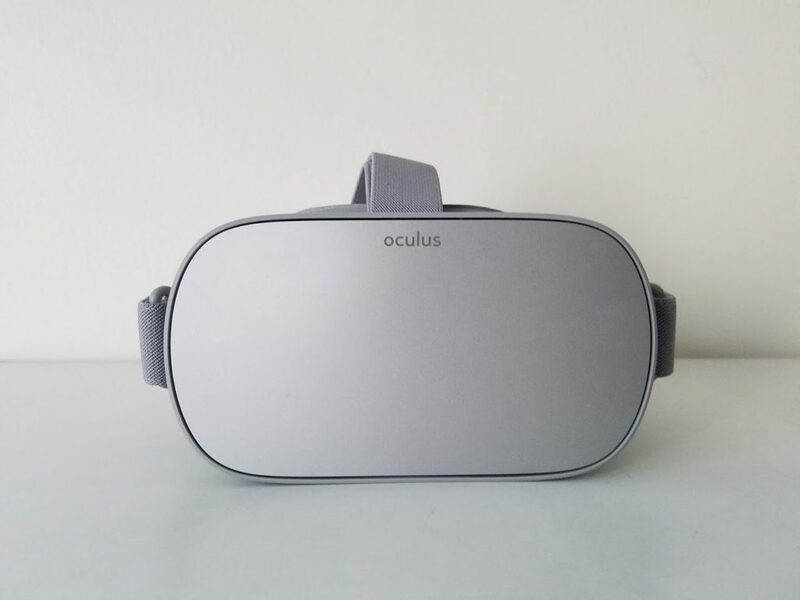 The Oculus Go looks similar to Oculus’ desktop dependent headset, the Oculus Rift, and feels similar as well. The Go’s screen resolution is at 2560×1440, which is a nice upgrade over the Rift and Vive’s 2160×1200 resolution and leaves everything looking a bit crisper. After using the Daydream or Gear VR for extended periods, I often feel significant strain on my eyes, however, with the Go I was able to watch a film in it for about 2 hours and felt no discomfort whatsoever, which is a big thumbs up from me. The Go can even house prescription lenses for people who wear glasses. Everything runs smoothly at 60hz, which is a step down from the Oculus and Vive’s 90hz refresh rate, however the Oculus does feature a 72hz mode for some apps, but the lower refresh rate was only really noticeable in games. What impressed me the most about the Oculus Go was the audio. The Go does allow you to use your phone headphones, however the native speakers are shockingly good. The directional speakers function like headphones without wearing anything over your ears. I’ll typically use the native speakers, but it’s nice to have the option of headphones when I start to feel like I might be annoying the people around me. The Go’s controller is simple and comparable to the Gear VR or Google Daydream controller. It features a small track pad and a trigger button and moves with the direction you point or rotate your hand, but not with the full freedom you get from the Rift or Vive’s tracked controllers. So the hardware is pretty solid, but how about the content? The games are fine, but aren’t nearly as fleshed out as the larger scale games on the Rift or Vive. The Go headset isn’t position tracked like the Vive or Rift, so don’t expect to be able to walk around once in the headset. I was happy to see that games I had purchased on my Gear VR were now available to me on the Oculus Go. There are still some fun titles to look out for on the Go, such as, “Lands End” or “Virtual Virtual Reality”. Where the Go really shines is with its video content. I had plenty of exposure to short experiences and 360° vidoes on my Rift, however the ease of access with the Go has made it my go-to headset for viewing 360° content now. Being able to watch 360° content wherever I am is very liberating. There’s no dedicated Youtube app on the Go, which is very disappointing since Youtube has lots of 360° videos, however you can still access Youtube on the Go’s web browser and the Go has other apps with great content such as the New York Times or VeeR VR. I found myself using the Go for watching Hulu and Netflix too. Both Netflix and Hulu have apps for the Go where you’re able to sit and watch your favorite shows on a large screen in a virtual living room space. Being able to slip on the headset wherever I am and having a portable movie screen with me was a lot of fun. Is the Go worth it at $200? If you’ve been wanting to try VR but the phone-dependent options feel like a pain or even leave you feeling ill, then the Go is a fantastic alternative. It’s not going to be perfect for everyone, but for me personally, the comfort level between the Gear and the Go was a huge step up. It’s awesome to have an all in one headset like the Go where all you need to do is slip it on and you’re ready to go without any hassle. I know I’ll be frequently using the Oculus Go to quickly watch 360° content or just to lay on the couch and project a movie onto the ceiling.